A Wedgwood, dark blue jasper dip , straight sided jug. 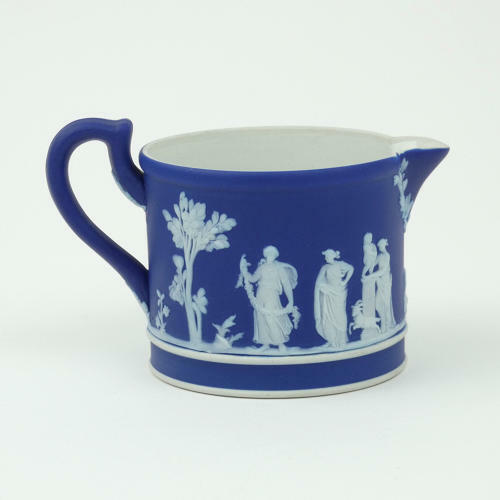 This piece is marked 'WEDGWOOD' and 'MADE IN ENGLAND' to the base. It dates from c.1920. There is also an impressed number '36' and this is probably the batch number. This is a very attractive, simple but classic shape. It is decorated with a band of classical figures and trees in white relief and the jasper dip is a very deep, rich shade of blue. The reliefs are finely detailed. There are leaves, also in relief, around the spout and handle. The piece is in excellent condition. Price includes postage within the U.K. Shipping to the U.S.A. add £15. Western Europe add £8.